There are many spring flowering bulbs in the Moosey Garden, the result of having two daffodil farms just around the country corner. But flowers with corms, tubers, and rhizomes should be included in this section, too. There's more to life than daffodils! Tulips, for example - my relationship with my tulips is sadly rather severe. I don't lift them or replace them, and consequently if they lose vigour (which they do) we fall out! Daffodils are my real spring favourite - and I've resisted the temptation to classify mine correctly. In line with the Moosey Random Gardening Style I've looked in terms of colour groups. I also grow Agapanthus, Nerines, Dahlias, Peonies, Irises, Alliums... The list is ever expanding. South African plants are popular and available, as are many varieties of the love-or-loathe-them gladioli. My spring bulb collection, however, seems to take pride of place. Enjoy! I've collected up my best daffodil photographs to display on this page. You'll see the fluffiest doubles, the frilliest split coronas, the prettiest trumpets, and the subtlest colour combinations. Enjoy! From mid-summer on the flowering dahlias fill my garden with noisy colour. They are summer show-offs, bright and entertaining, and pop up everywhere. Look at me! No, look at me! Me too! Hyacinths in pots - now why didn't I think of that before? They fill a container so beautifully, with so many bright and subtle colours to choose from. I must be the last gardener in the world to actually get around to doing this rather simple thing. Daffodils and kittens - awwww! Definitely two of my favourite things. This year's daffodil planting time has coincided with the newest Moosey kitten (Little Mac) becoming fully garden-trained. This should be fun! My latest miniature daffodil is splendidly enjoyable. He's Rip Van Winkle, a personality daffodil with bright yellow bed hair, awake to catch the early morning spring sun on the edge of the Stables Garden. Bright yellow daffodils are a powerful symbol of sunny spring days, and the most representative of all the daffodil flower styles. Ask a child to draw a daffodil and this will be what you'll get. They're big, bright and unsubtle, and can be seen from a distance. Nice! It's daffodil time again. How wonderful - I can join in Daffodil Planter's flowery festival. Spring gardeners in the northern hemisphere should have their daffodils up and blooming by now - lucky things! These delicate apricot coloured Watsonias came unheralded into my garden, a gift in the post from a fellow gardener. They were immediately lost in the spring hustle and bustle of greenery - totally my fault. I am a hopeless 'noticer' of the subtler flowering plants I grow. 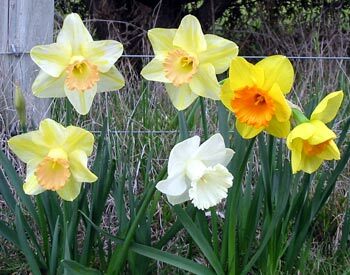 My friend Daffodil Planter has organised a blogorama for the coming of spring, and the flowering of the first daffodils. Yippee! I'm invited to join in and celebrate this exciting time of the gardening year. Bulbs in the bulb section usually have to be grown on site, a record of my own plants in my garden. But after a visit to a garden in the USA I'm desperately in love with purple flowering Alliums. I haven't got any yet, so I'm breaking my own rules! Many gardeners will have experienced this. Suddenly an odd little flower or plant pops up - when did I plant that? And where on earth did it come from? Such is the case with one of my latest spring treasures - a large flowering crocus. The very first daffodils to flower in the Moosey spring garden are the miniature yellow trumpets. I grow several clumps of these, sensibly placed (for once) right on the edge of the garden beds. Finally, a summer flowering flower grown from a bulb - well, actually a corm! Gladioli have a definite summer style, and they come in a gaudy range of bright colours. Like dahlias they are a symbol of the colour-filled suburban flower garden. If I am to be taken seriously as a gardener, then my garden must feature more flowering bulbs than just daffodils and tulips. And so it does - these Spraxias (or Sparaxias) arrived by accident (clinging to a daylily) and I love them! Did I ever claim that I don't bother much with tulips in the Moosey Garden? Foolish gardener! These soft pink and white tulips are absolutely beautiful. These beautiful blue spring flowering bulbs are often taken for granted, or told off for self seeding. They are, of course, Muscari (or Grape Hyacinths). They're most welcome in the Moosey spring garden. These two daffodil montages include many of my favourite daffodils. They've popped up on other pages, but are well worthy of a repeat performance. It's no surprise that gardeners look forward to spring, is it? I have a clump of these unusually coloured spring daffodils growing in the driveway garden. Their petals are a lemony yellow, and their trumpets are the colour of terracotta. Some gardeners think that all-white daffodils are the height of style. I'm very fond of those in my spring garden - I have some clumps of whites-only, as well as smaller solo whites in the mixed plantings. Hyacinths don't get any special treatment in the Moosey Spring Garden - these fragrant spring bulbs live and grow in small patches by the glass-house. Help! - my abilities to adequately describe a daffodil are getting weaker by the moment! I've grouped two pretty daffodil flowers on this page - both have delicate orange centres. This is one of the unusual bi-coloured daffodils I grow in the Moosey garden. By good luck rather than design I have several uniform clumps. They look like split coronas and doubles. Forgive me if I refer to them as 'fluffy'. Tulips have had mixed success in my free-draining, slightly sandy-soil garden. In my early gardening days the wind would destroy my carefully positioned groups, blowing them over. Then, in the second year after planting, the tulips would refuse to flower. By the fourth year they'd have totally disappeared into the gardening underworld. This delicate and fragrant daffodil isn't the earliest to flower in the Moosey spring garden, but it is always eagerly awaited.I plant it alongside paths so it can be fully appreciated by the discerning gardening nose. I've grouped together some different varieties of the apricot-pink and creamy white daffodils which I grow - this colour combination is so beautiful and subtle. Eucomis are commonly called Pineapple Lilies, and they grow from bulbs. I grow them in pots and in clumps in the garden, and my latest mail-order nursery purchase promises deep ruby leaves and purple flowers. Nice! This beautiful red Canna lily was one that I ordered through the mail from a specialist grower. It has a slightly stripey look to its leaves, with the colours of a forest green and maroon. I used to able to see the red flowers from the upstairs windows of the house.